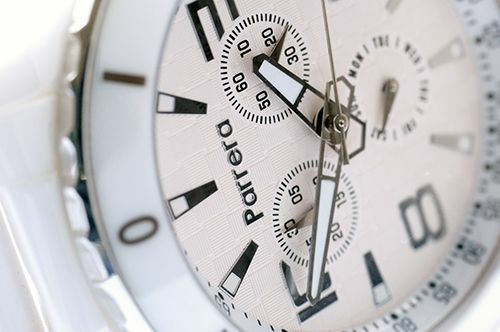 Something less serious today, the Parrera Ceramic Day-Date Chrono in white (also available in black). I actually don’t think this is a men’s watch, but hey, who am I to judge of course. I never heard of the company, but Ace Jewelers – one of the sponsors here – has these watches up for sale in their e-boutique. 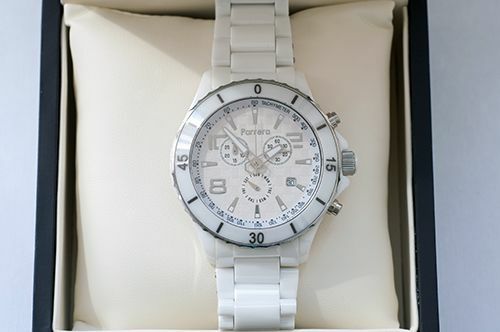 I got the white one for Mrs Fratellowatches, who seems to love white ceramic watches. Ever since the Chanel J12, a lot of other brands (low-end to high-end) are willing to ride this wave. This fairly large watch of 42mm in diameter makes it suitable for a lot of wrists, even the smaller ones, like my wife’s. She normally wears a 36mm watch that covers up all of her upper wrist, but she finds this oversized watch to be quite comfortable. The white ceramic case and bracelet makes it a very heavy watch, probably as heavy as my Sea-Dweller. The quartz movement is Swiss made and features a 60 minute chronograph, a day (subdial at 6 o’clock), a date and hours, minutes and seconds of course. 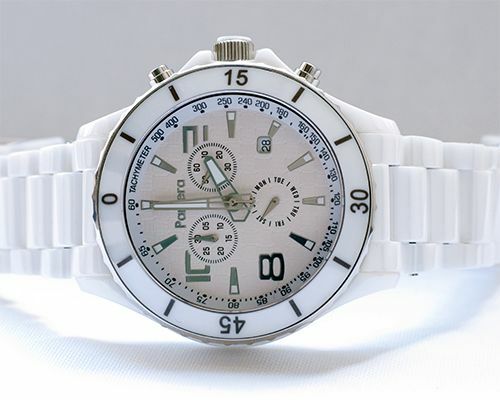 The bezel is also from white ceramic and looks very sporty on this watch. Although I don’t think you should go diving with it (50 meters water resistancy). The white dial is stunning, the pattern on it makes it look like a cream coloured dial from some angles. Crown, hour markers and hands also feature white details to match with the case and bracelet. I didn’t expect a sapphire crystal on a watch with this price tag (see below), but it really has one and is probably one of the aspects that gives this watch such a solid feel. The watch comes in a very nice square shaped presentation box, but if you want to have it gift wrapped, you can tick this check box over at AceJeweler’s e-boutique. The watch comes with a lot of links, so you will probably have to remove them (or have them removed). It is quite easy if you have the right tools to do that. You should at least have some experience with ‘driving out’ pins before you start. For 250 EU, I think you can buy the Parrera (also available in black) with confidence for you girlfriend of wife. She will like it for sure. You can also – of course – buy one for yourself. The full review of this watch is available over at WatchUseek where you can read mine and Ernie’s review. Visit the AceJewelers e-boutique to order your own Parrera.